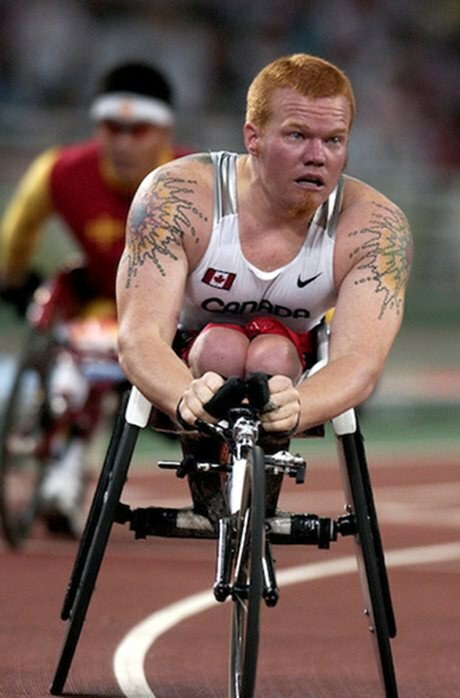 Jeff Adams is a Canadian Paralympian and world champion in wheelchair racing. At the age of nine, the radiation therapy used to treat his cancer permanently damaged his spinal cord, paralyzing Adams below the waist. Undeterred by his disability, Adams pursued athletics with a passion. By the age of 18, he was competing on the international sporting scene with the goal of winning gold at the Paralympics. At the 1988 Summer Paralympics in Seoul, Korea, he won two bronze medals in the 800-metre and 1,500-metre events. Adams competed in the Paralympics until 2008, winning numerous medals – including three gold medals in 2000. He has since become an advocate for disability in sport, and an innovator in the manufacture of wheelchairs. For his work and achievements, he was inducted into the Terry Fox Hall of Fame in 1997. Learn more about Adams – including his Paralympics statistics – on the Canadian Paralympic Committee website. Watch Historica Canada’s Heritage Minutes video on Jeff Adams. Listen to Jeff Adams talk about his early life and learning how to use a wheelchair here.